Thanks for the great feedback about 3.1 Beta 1. Here's a new beta with some changes and enhancements. At a first look working fine now! Thanks a lot for taking a look and for your feedback! Also waiting for feedback from others members. Especially from date, who requested the changes in tag suggestions, and Chris, who took part in the feature discussion. Yep, seems to work now, at least for the testing I did. Are these only tags from the current section, or the whole notebook? I did run a small test on a really long tag with lots of letters in it, just to see if the dropdown list was going to offer a horizontal scrollbar, or just cut part of the tag off - optionally with a tooltip when you hovered over the cut off tag. The dropdown seems to just expand ever wider - is there a practical limit to how wide it will expand to? I didn't take part in the original discussion because I got lost a few posts in, and couldn't quite grasp what the final changes were going to be, so I decided to wait and see what was actually implemented. Tagging is something near and dear to my heart however, and now we have something actually up and running, so now is the time. I will start with this question, as it may prevent the need for follow-on questions on the tagging change. Does this only affect the editor? That is, it only occurs when you are adding a new note (or have the note open to edit it), not when you are just in the notes list and are using the search field for tags. If the answer is 'yes, it only affects the editor', this change may not affect me too much. I did try the editor, and when I clipped some text, I found the tag dropdown automatically activated when the editor appeared. I find that quite annoying visually, so will be changing the settings file to turn it off (I would personally prefer this defaults to off - ie the tags dropdown does not appear immediately upon clipping some text). So just a tiny bit of tweaking to do. As reported above, this is fixed now. usbpoweredfridge wrote: Are these only tags from the current section, or the whole notebook? These are tags from currently active sections. If there are no such tags, tags from whole notebook are displayed. I did run a small test on a really long tag with lots of letters in it, just to see if the dropdown list was going to offer a horizontal scrollbar, or just cut part of the tag off - optionally with a tooltip when you hovered over the cut off tag. The dropdown seems to just expand ever wider - is there a practical limit to how wide it will expand to? I assume there isn't, but using such long tags is impractical anyway. A problem, but a minor one. I will start with this question, as it may prevent the need for follow-on questions on the tagging change. Does this only affect the editor? No, it affects all fields that accept tags as input. Including the search box. But as soon as what you typed doesn't match any of the "local" tags, the list of suggestions is extended to include tags from all sections. I found the tag dropdown automatically activated when the editor appeared. I find that quite annoying visually, so will be changing the settings file to turn it off (I would personally prefer this defaults to off - ie the tags dropdown does not appear immediately upon clipping some text). Ah yes. I forgot that the Tags field automatically receives focus after clipping. Hence the popup. This can be fixed by focusing the proper (i.e. configured in Options/Editor/Initial Focus) field. This auto-focusing of the Tags field is an oddity anyway, and with it gone there will be less oddities to explain. See what happens here: you have empty lines delimiting the list elements, and CN doesn't recognize the 2nd and 3rd line as being part of the list. So only the 1st line is part of the list, the other two are plain text. Hence the difference in indents. We could of course make list-detection logic in CN more sophisticated to recognize such lists, but the question is if it is worth the needed effort. CintaNotes Developer wrote: No, it affects all fields that accept tags as input. Including the search box. But as soon as what you typed doesn't match any of the "local" tags, the list of suggestions is extended to include tags from all sections. I may have found a problem with this. I had two sections, one tag in each. First section, the tag was 'test'. Second section, the tag was 'testingreallyreallyreallylongteagitsreallyreallyreallylongreallyreallyreallyloooooooooooooooooooooooooong'. With the second section active, I typed 'test' in the search field - it found the really long tag. Ok so far. However, I did not want that tag, I wanted the other one - but unless I cancel the search and select all sections before doing the search again, the other tag won't show (at least there is no other way to make the shorter tag show that I know of). Yeah, the test stacks things against CN In this case (it is an extreme case) - deliberately so on my part I will admit - but I think it shows a general case of problems with 'longer tag in one section, shorter tag with similar characters to longer tag in another section, you are in the section with the longer tag when you start the search, CN will not find what you want if you want the shorter tag'. Speaking generally, the logic behind the change seems a bit convoluted to me - maybe this is because I didn't fully understand the original discussion around it though, so it might just be my fault. I think your idea of how it would work is sound (quoted that bit from the relevant thread just below), but I think I would have implemented it differently. I would have done a simple settings file option - old behaviour by default (how CN worked before Beta 2), toggle the option on, and you get the new behaviour (the behaviour you described in your post, and what is implemented in Beta 2). It seems what you have tried to do is to make this dynamic, 'on the fly' so to speak, so the behaviour you get (old or new) depends on what you are trying to do at the time. That's a bit unpredictable for my liking - when it comes to UI design, I very much value consistency of operation (ie, do the same operation over and over, and the program will behave exactly the same each time, and this change doesn't guarantee that from my short experience with it), and I think it over-complicates things (I think people are either going to want the old behaviour, or the new - I don't think they will want to switch between them on the fly, though it is impossible to measure user reaction to that, either way, so as the dev, you do have to just make a best guess). I'm not against change per se, but on the face of it, I fear that this change may make things more difficult for me and my workflow (I am often not in the right section of my notebook when I clip some text, so I appreciate tags showing for the entire notebook - that way, I can select the right tag straight from the list and then just change the section using the section dropdown at the bottom of the editor, and the note is saved to the correct section with the correct tag). Sigh - time will tell I suppose. CintaNotes Developer wrote: But! I have a great idea. I always wondered what the remarks-field was useful for, when you have to open the note to view them. Looks like I might get some use out of it now. Great improvement! There are 5 fields in the note window, and you used to be able to move quickly between them using PgUp-Dn and the up-down arrow keys. This stopped working at the time attachments were implemented, when one was added, but now it isn't working at all anymore. Also has a slight 'unexpected' feel to it. I think that (besides the usual Ctrl-space) displaying the list on a mouse-double-click (for example), instead of on merely getting focus, will account for a more harmonious experience while still being a nice new feature for mouse-users. Ok, but it doesn't work? It doesn't feel as 'consistent' as I thought it would. Being only a slight improvement, and apparently not perfect for everyone, this might be more suitable for a non-standard switch in the cintanotes.ini-file. As soon as you start typing, the list shortens significantly anyway. I'm much more charmed with the Ctrl-space-shortened-list above! i confirm the http link recognition works fine again. As for the auto-tag-display, i disabled it right away as it might require one to press ESC twice to close the dialog. This happens, when i want to edit tags only and close the editor after that. As for the new feature "tags per section" is there an option to disable it? Thanks a lot for your opinion, guys! - The auto-popup feature is annoying. - Filtering of tag suggestions by active sections, although useful when there are a lot of tags, can have some unexpected side-effects and makes the behavior less predicable. But we still need to collect data to see if the advantages outweigh the negative effects. Also even after you've typed something, you can press Ctrl+Space to make sure that you see tags from all sections. Decision: leave as an option, turned on by default. - Filtering of tag suggestions on Ctrl+Space is definitely much more useful. Want to say thanks to you one more time. The design process is not simple, it is always about tough decisions and balancing act, and I'm lucky to have people here who will help avoid bad decisions. As a result, we all will have a better product in the end. Thank you. CintaNotes Developer wrote: Thanks a lot for your opinion, guys! It just occurred to me, why not display the list of the current section on a single-click, and the list of every section on a double-click? That way mouse-users and keyboard-users are treated equal. This idea was 'good' just not 'perfect.' You really need over 400+ tags for this to be beneficial. I can't help but to think this one is not well-thought-out enough. This works perfectly, thank you for considering it! I'm not a mouse-user, but maybe the above-mentioned idea would work as an alternative. I think the second option (the dynamic list once you start typing) should be treated differently and default to 'off.' Or be postponed until more/better ideas come along. I hope to have helped make CN more 'perfect' ! It can also be done backwards, ie just the old behavior, but on second ctrl-space press, shorten the list to the current section's tags. In that case, there won't be a need for an extra option. CintaNotes Developer wrote: - The auto-popup feature is annoying. CintaNotes Developer wrote: - Filtering of tag suggestions by active sections, although useful when there are a lot of tags, can have some unexpected side-effects and makes the behavior less predicable. But we still need to collect data to see if the advantages outweigh the negative effects. Also even after you've typed something, you can press Ctrl+Space to make sure that you see tags from all sections. Yes, it certainly makes it less predictable. I'd still prefer default=off personally (ie all tags by default). CintaNotes Developer wrote: - Filtering of tag suggestions on Ctrl+Space is definitely much more useful. Yes, I can see an explicit toggle as being more useful - I don't think the current system whereby CN decides itself on the fly as to which mode is active can be made to work. With a toggle, people who don't want to use the new system don't have to - and would be roughly equivalent to my preference for a setting in the CN settings file to enable/disable it. The question is - should the default be the toggle to turn the new behaviour on (ie only show tags in that section unless you hit the toggle), or should it be the toggle to turn the new behaviour off (ie show tags from the entire notebook unless you hit the toggle). Either way, one group of users is going to be irritated I fear. CintaNotes Developer wrote: Want to say thanks to you one more time. The design process is not simple, it is always about tough decisions and balancing act, and I'm lucky to have people here who will help avoid bad decisions. As a result, we all will have a better product in the end. Thank you. date wrote: I can't help but to think this one is not well-thought-out enough. Yeah, I have to agree - I think it needed some further thought before being implemented as well. Oh well, sometimes that happens in software development - we're all only human after all - the important thing is what happens with the feature now, and where we go from here. usbpoweredfridge wrote: The question is - should the default be the toggle to turn the new behaviour on (ie only show tags in that section unless you hit the toggle), or should it be the toggle to turn the new behaviour off (ie show tags from the entire notebook unless you hit the toggle). Either way, one group of users is going to be irritated I fear. How about doing it backwardly? The usual behavior, showing all tags, except when ctrl-space is pressed again, shorten the list. PS: these are two different new features about tag completion. (I wouldn't even mind getting rid of the second one.) But the first one can be a great time-saver. If the first (or both) one(s) are done backwardly, no one would be irritated because you have to explicitely press again for the shortened list. date wrote: It just occurred to me, why not display the list of the current section on a single-click, and the list of every section on a double-click? That way mouse-users and keyboard-users are treated equal. I think the correct thing to do here would be to add a "+" button inside of the Tags field for picking tags by mouse. All these clicks/double clicks are a bit obscure and wind up on the list of "hidden features", which makes CN more difficult to master. But it seems to be more like a problem fix than a new feature, and was easy to implement, that's why I decided to try implementing it right away. I don't agree that this is that bad. I've improved it a bit: added into the mix the edited note's current section, added the option to the UI and named it "Context-Sensitive Suggestions". IMO makes sense. I think you did, thanks. 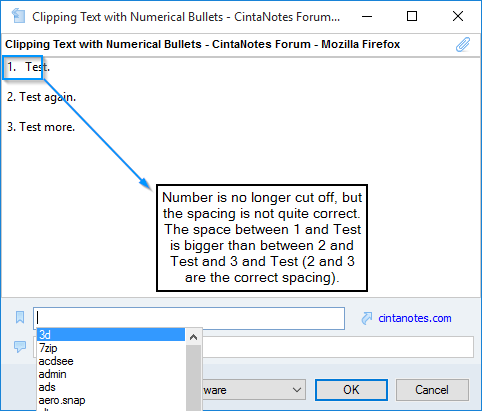 date wrote: It can also be done backwards, ie just the old behavior, but on second ctrl-space press, shorten the list to the current section's tags. Don't think this is a good idea. That would be another hidden feature, which behaves unintuitively (people expect that extra action will show extra info, not hide it). From the program's designer standpoint, there's no reason to introduce a new option and leave it "off" by default. But I've improved it somewhat, added the edited note's current section into the "active context". So after clipping, if you assign section first, then you'll receive the needed tag suggestions. Probably you should try it out. If you still don't like it, you can tick the option off and be done with it. And remember that you can always press Ctrl+Space at any time to force diplay of all possible tags. Yes. The new 'Options/Tags/Context-Sensitive Suggestions" option will be such toggle. I think you should try living with this option for a while. I tried, and I must say it helps, especially if you have logical splitting of notes into sections. The tag filtering will stay as a new option "Options/Tags/Context-Sensitive Suggestions", which would be on by default. If after the release I start receiving a lot of complaints, I'll make the "off" position the default one. Let's try and see how it works out! please note that CN currently doesn't support and thus can't recognize multi-level lists.